The C 130.2 high pressure washer is ideal for all types of infrequent outdoor cleaning tasks. The C 130.2 offers a great value of performance and flexibility. 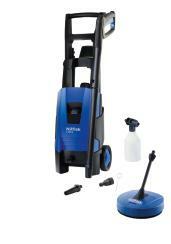 It is perfect for anyone who needs a basic ergonomic pressure washer with good performance. Its trolley is designed for easy storage of all standard accessories. With the Click&Clean system it is quick and easy to change nozzles, and the standard Nilfisk bayonet coupling ensures compatibility to the large range of Nilfisk accessories.